Are your exterior timber surfaces faded or cracked? Is the sandstone around your commercial premises dirty or slippery? Never fear – Outdoor Cleaning Specialists can help! Our commercial sandstone cleaning and timber cleaning services rejuvenate and extend the life of the sandstone and timber surfaces around your business. Sandstone is a fantastic feature of any property, however the porous nature of sandstone means that over time, dirt and mould can set in. This not only results in a dull, grey appearance, it can also make sandstone paths and pavers a slip hazard for your customers and staff. 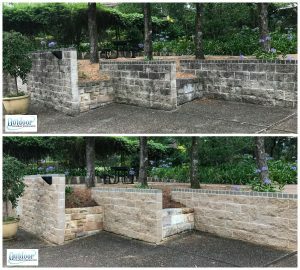 At Outdoor Cleaning Specialists, we can restore your sandstone to its original lustre and colour. We apply the most appropriate sandstone cleaning method depending on surface finish, volume of traffic and degree of staining/algae growth. We can also clean and protect all types of exterior timber around your property, including fences, retaining walls, decks, furniture, and more. Timber left exposed to the elements can crack and warp within the first year if not properly protected. Sun and rain may discolour the timber’s surface and in the longer term, allow attack by destructive fungal decay (wood decay fungi) commonly known as ‘dry rot’. That’s why regular maintenance and sealing will extend the life of all your timber. Our soft pressure timber cleaning service removes dirt, grease and other contaminants, preparing the ideal surface for you to paint, oil or seal to protect your timber. Need commercial sandstone cleaning or timber cleaning in Sydney? Get a FREE quote today by calling 1300 870 626 or completing our online enquiry form.